a) Boot into Windows and take a look at the file X:wubibootgrubmenu.lst where X is the drive where you installed it. See if there is anything pointing to the incorrect location. It may have something to do with the fact that you have installed it on a drive other than C. I installed Ubuntu on C and didn’t have this problem. b) Ubuntu is gui based. It is really easy to use and a very good user interface. You will enjoy it once you get over the problem. I am about to try it. I downloaded the Ubuntu installer today, and I got home, and started it up, but it wanted to download Ubuntu. This would be OK, but I don’t have internet on my computer. Anyway, I hope this works. I am really getting annoyed with this ISO stuff. Everyone tells me that you have to download this LiveCD with ISO, and IT WILL BOOT RIGHT UP. Well, it has not for me, so I hope this will work better. 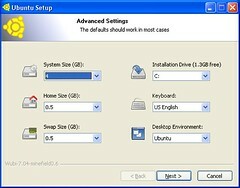 Question: It will reconise my CDs when running Ubuntu right, because the only way that I can install programs for Ubuntu is by downloading it on another PC and putting it on my flash drive, then installing it to Ubuntu. Question 2: (email me about this) I know for a fact my graphic card will run the special effects, but I have been using VirtualBox program, which is letting me run it from CD, but NO animations, will this be faster and more graphical even thought it is a virtual machine? Thanks for stopping by. You can install this on a machine without an internet connection, if you read Step 2 above again it explains how to do it. If you install Ubuntu to your harddrive (using Wubi) then your CD drive will be free and you can load on software using CDs. 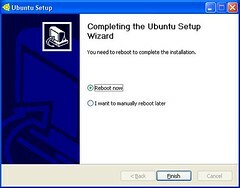 When I ran Ubuntu using a virtualized environment (both VMware and MS Virtual PC) i ran into some hardware detection issues. Only when I installed Ubuntu on my harddrive did everything work ok. I would say to try the install and you should be able to use the graphical interface and it should be faster as well. If it doesn’t work out then the Wubi installer allows you to easily unintall. Hello to another Deasy! About ten years ago I was in Clonakilty and met a Sean Deasy who worked in the library. We went to his house and met the entire family. Is that Sean you? If so, Hello! If not, hello, too. I’ve been researching the Deasys for many years and have tried to find our link back to Ireland. Any Deasys in Bandon that you know of? I think my GGGrandfather came from Bandon in 1848–named Charles Cone Deasy. Ring a bell? Hope to hear something from you sometime. I AM A NEWB – how does one do a backup of the files? What files do I need to backup, etc. Can I just save the backed up files to a USB stick and then reload my settings? BTW – really do like Ubuntu, except for not having sound! Sure wish there was a restore function or reload function kind of like within XP, where you insert the disk and you get to chose what to reload! You would only need to backup any of your personal data, like any music you copied into Ubuntu or documents you created. 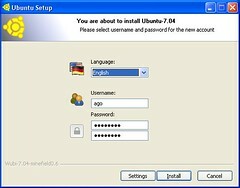 If you have only installed Ubunutu and haven’t created any personal which needs to be backed up then if you go back into Windows and using Wubi you can uninstall and start the process over. If you do have personal files that you need to back up then you can copy them to a usb drive. Best thing to run nautilus which is a file manage, locate the files and copy them to the usb drive, similar to using Windows Explorer.